For almost 28 years, James Legal Services, P.C. and its predecessor firms have represented individuals and families in serious personal injury and wrongful death cases across the country. Concentrating primarily in transportation and products liability matters, the firm is committed to helping people who have suffered tragedy by the wrongdoing of others. For those of us at JLS, this commitment also goes beyond the courtroom. For the past several years, the firm has set aside a portion of lawsuit recoveries for the benefit of charities of their clients= choice. In the past 2 years alone, we have made donations to the Metropolitan Organization to Counter Sexual Assault (MOCSA), www.mocsa.org, Harvesters Food Network, www.harvesters.org, the Amputee Coalition of America, www.amputee-coalition.org, and the NASCAR Foundation/Victory Junction Gang, www.victoryjunction.org. In addition to supporting a number of worthy causes, we believe that this program also shows people that our civil justice system can work to benefit society as a whole. 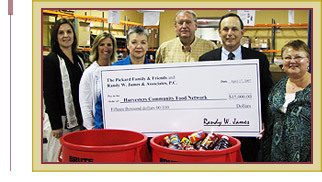 In 2007, Randy James worked to establish the Missouri Trial Lawyers Care Fund, the charitable arm of the Missouri Association of Trial Attorneys. www.gkccfonlinedonations.org/motlc/motlc.asp Known as MoTLC, the fund has supported a number of causes including sponsorship of free personal safety and self defense courses for moms and daughters, bicycle helmets for kids, drunk driving awareness and education courses and contributions to several natural disaster relief efforts. James also brought MATA together with the American Red Cross in 2008 to form a partnership to provide free legal services to victims of tornados, floods and other disasters. The first program of its kind in the country, lawyer volunteers work on site in conjunction with the Red Cross to advise and protect victims in dealing with contractors, insurance representatives and governmental agents in their time of need. James also helped lead a community/school district effort to develop a comprehensive K-12 personal safety and self-defense curriculum in the Lee=s Summit, Missouri R-7 School District. Also believed to be a ground breaking project, the curriculum coordinates all of the schools in the district so that each student is taught age appropriate lessons about personal safety and self defense at every grade level. As a part of this effort, JLS, Blanket and Bear--James Family Charitable Fund for Children and MoTLC sponsor twice annual free CounterAttactics personal safety courses for women and girls in cooperation with Lee’s Summit Parks & Recreation. To date, almost 800 people have attended these courses. www.counterattactics.homestead.com. At his alma mater, the University Missouri-Kansas City School of Law, James was a co-founder and sponsor of the H. Michael Coburn Legal Scholarship Fund. The fund awarded scholarships of almost $400,000 to over 100 law students who have displayed excellence in trial and appellate advocacy since 1996. James recently funded a new recruitment scholarship fund at the UMKC School of Law that will support one student each year who displays a commitment to civil justice and community service. The first award was made for the fall semester of 2009. At JLS, we know that the things we do to support our community are not unique. Lawyers and law firms donate their time and money to worthy causes every day without fanfare. But in a time when the reputation of the legal profession, particularly trial lawyers, is under attack, it is important that the public understands the selfless contributions members of our profession make to society. While it may be tempting to talk about big verdicts and settlements, our legacy is not in our wins and losses, but in what we give back to those in need.